Concerned iPhone users and digital security supporters will gather at 5:30 pm local time at Apple stores in nearly 50 cities today, Tuesday, February 23rd, exactly one week after the Justice Department won a court order that attempts to force Apple to write software that would undermine the safety and security of millions of people. 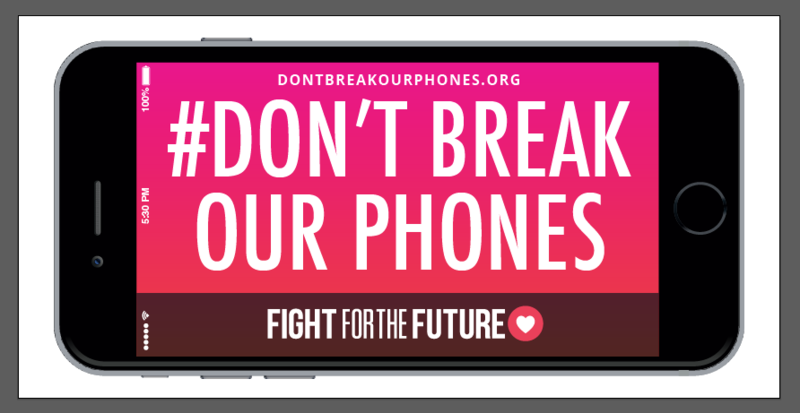 WHAT: Protesters will oppose the DOJ’s demand, carrying giant 10-foot long iPhone banners (see example), and iPhone shaped signs reading “FBI: Don’t Break Our Phones” and “Secure Phones Save Lives.” Participants will also be able to turn their phones, laptops, or tablets into a glowing protest sign using ProtestSign.org. The giant iPhone banners will be on hand in most of the larger cities, but not at every protest. WHO: The rallies were called for by Fight for the Future and are supported by Demand Progress, CREDO, and other advocacy organizations. The rallies are being organized in a grassroots manner by individuals who agree to host an event in their town. Fight for the Future then provides those members with banners and support with recruitment. More events are being added all the time, so check back on Tuesday if you don’t see one in your area yet. WHERE: Rallies are already planned across the U.S. in small cities like Anchorage, Alaska, and major ones including New York, San Francisco, Chicago, Los Angeles, Palo Alto at Apple’s headquarters, Minneapolis, Philadelphia and Boston. Supporters outside the U.S. have planned rallies at Apple stores in London, and Munich. In Washington, DC, protesters will gather at the FBI’s headquarters, the J. Edgar Hoover building. WHEN: Tuesday, February, 23 at 5:30pm local time in each city. This past Wednesday, after Fight for the Future issued the call for rallies at Apple stores, there was so much interest that they decided to organize one in San Francisco that day on just a few hours notice. Dozens of people turned out to protest the FBI’s position. See photos here. Fight for the Future and Demand Progress staff members are available for interviews and can connect journalists with the hosts of rallies in specific cities upon request.